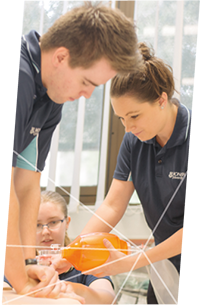 Monash Nursing and Midwifery’s state of the art 'Clinical Learning Environment' (CLE) prepares students for their life on the health care front line. The environment reflects what a modern day health care environment, looks, feels and sounds like and enforces the dress code and behaviours expected of students in the real world, whilst preparing them in a safe and educational environment. The environment utilises real simulated patients so that students have an authentic learning experience, with equipment the same as that in the hospital setting. Students are therefore afforded the opportunity to practice with the equipment they will be expected to use during a clinical placement. High-fidelity simulation mannequins and a purpose built simulation room also allow the recording and playback student performance and the running of “real life” scenarios that support learning. The CLE environment enables students to bring together all of their classroom learning and is where students really start to explore the art and science of nursing and midwifery practice.